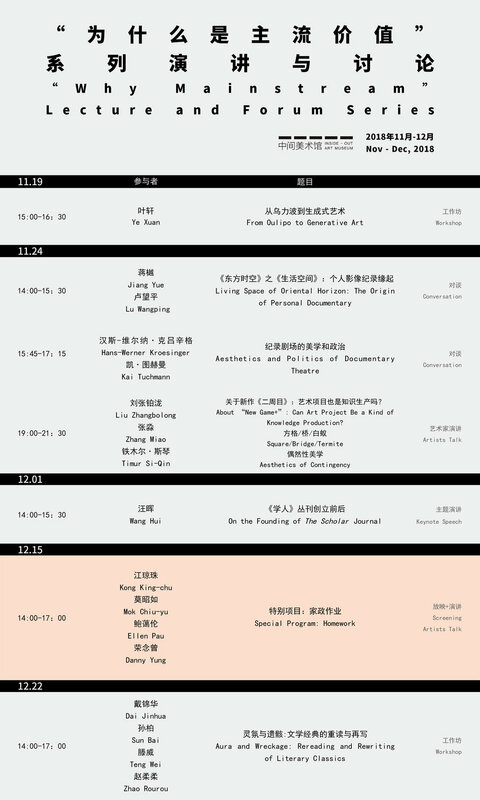 As a special program of the exhibition, “Homework ” is composed of screenings, discussions and workshops. Several Hong Kong artists will be invited to review and contemplate on the voices that art has made in the transitions of society and artistic trend, from such perspectives as film, visual art and news. Their artistic careers can be traced back to the 1970s and 1980s, when the voices of the “Left”, “Returning” and the new generation of Hongkongers started to surge and integrate. Born in Hong Kong in 1947, Mok Chiu-yu is a film director, writer, translator and educator. He has been participated in many social movements since the end of 1960s. He is also one of the founders of the biweekly magazine The 70's. Additionally, he takes an active role in promoting community theatre and fighting the human rights for the disabled. Kong King-chu is a senior journalist who has published books including, See You on the Road, Return to a Place Named Home, Minds about Elderly Caring，Touching Stories about Organic Agriculture, Fifty years of Helping the Disabled in HK, On the Ramp, Marycove: Forty Years of a Girls’ School. In the Recent years, she has been devoting to documentary filming. Her works include We Always Read Xi Xi, Almost a Revolution, Franco Mella, etc. Known as the godfather of Hong Kong culture, Danny Yung was born in Shanghai in 1943. He moved to Hong Kong with his family when he was five years old. At the age of 17, he began his study at the Department of Architecture at the UC Berkeley and then the University of Colombia, received an undergraduate degree in architecture and a postgraduate degree in urban design and urban planning. After returning to Hong Kong, he has been engaged in various artistic practices including cartoon, theatre, film, visual art, etc. In 1982, he founded the groundbeaking experimental theatre group called “Zuni Icosahedron”. Born in 1961 in Hong Kong, Ellen Pau is a video artist, active in both domestic and international art circles. She is also a curator of new media art. In 1986, she co-founded Videotage, a new media art institution undertaking the mission of developing new media art and boosting the communication of artists in Hong Kong. She is also one of the founders of Microwave International New Media Arts Festival. In 2000, her video Recycling Cinema was selected and exhibited in the 49th Venice Biennial. Her book Dye-a-di-a-logue with Ellen Pau was published in Hong Kong and New York in 2004. Last year she was invited to be a member of jury for Transmediale – a German festival for art and digital culture.